I hope everyone had a lovely and nice short week last week, and also got tons of football watching in this past weekend. I know I did. This week has so much movie goodness going on, which is great because September is usually a pretty slow month. Here are the Local Haps with my pick of the week happening on Tuesday! Alamo Drafthouse: Tons happening tonight! First, there is an action-pack quote-a-long to one of my cohort's favorite films, SCOTT PILGRIM VS. THE WORLD. Then, there's a neat double feature at 7pm, FUNimation At The Movies: GHOST IN THE SHELL: ARISE AND HAL Double Feature. And if you still haven't had time to catch the 30th Anniversary showing, GHOSTBUSTERS will be playing again at various times today. Alamo Drafthouse: My pick of the week! 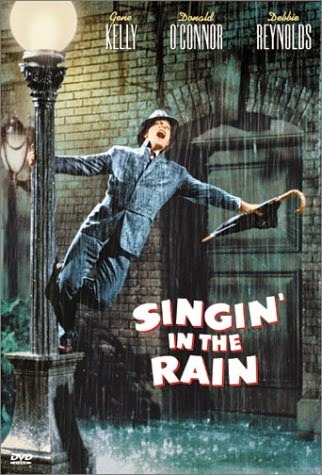 The classic musical, and one of my personal favorites, SINGIN' IN THE RAIN, will be showing at 7:30. Then, you can wonder over to monthly series, Video Vortex, for their presentation of MASTERBLASTER at 9. Angelika Dallas: A special presentation of a contemporary version Euripides' tragedy, MEDEA, will be playing at 7 pm. Alamo Drafthouse: Another night of tough choices at the Alamo. First, there is a special presentation of GALAXY QUEST at 7pm, which is a must see for any science fiction fan. Then, the Alamo goes abroad with a showing of AMELIE. Finally, another Alamo 100 showing is happening with a Girly Night quote-a-long of the classic CLUELESS at 8pm. Granada Theater: At 8:30 right next door to the Granada, there will be a showing of QUICKSILVER on the rooftop of The Sundown...for FREE! Texas Theatre: David Lynch's breakthrough music documentary, DURAN DURAN UNSTAGED will showing at 7:30pm. Alamo Drafthouse: The Dude abides with a quote-a-long (there's a lot of those this week) of THE BIG LEBOWSKI at 8pm. Then bust out your old Britney Halloween costumes for the Britney Spears sing-a-long dance party at 7:30. Texas Theatre: One of the iconic Schwarzenegger films, THE TERMINATOR, will be playing in glorious 35mm at 7:30 pm. Texas Theatre: He's back! Another showing of THE TERMINATOR will happen at 9:15 pm. Alamo Drafthouse: Time to check off two movies off of your shame list. Starting at noon, there's a double feature of THE GODFATHER and THE GODFATHER: PART TWO. Don't worry, the Alamo wouldn't waste your time with part three. Alamo Drafthouse: The James Dean classic, EAST OF EDEN, will be playing at 12:30. Texas Theatre: Named one of the top films of the decade by Cinema-Scope, LOS ANGELES PLAYS ITSELF will be playing at 4:30 pm.